The 11th Battalion Worcestershire Regiment was raised in June 1940, at Worcester. Only a cadre of 150 men of the Regular Army was available at Norton Barracks on which to build 11th Battalion and these included only four Regular officers. For three weeks Major Gerald Blakeney de Courcy-Ireland acted as Commanding Officer, with Captain A. E. R. Chichester as his Adjutant. 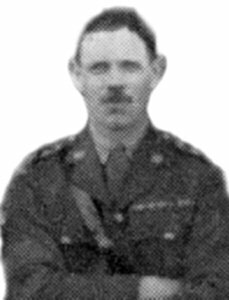 A Regular soldier who was early on the scene and who was to become an institution with the Battalion was Lieutenant and Quartermaster Arthur Yeates, formerly a well-known C.S.M. of 1st Battalion in the days of Plymouth and Aldershot. 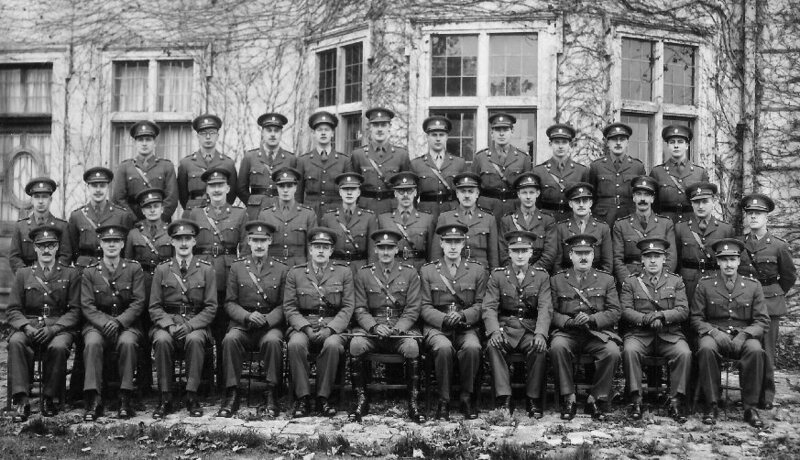 Early in the morning, on the 12th July 1940, a modest Advanced Guard left the Depot, at Norton Barracks, under the Quartermaster Arthur Yeates, to be followed soon by the Adjutant, and the nucleus of the newly-formed Battalion, and moved into camp on the race-course at Hereford. Shortly afterwards two drafts of freshly enlisted civilians, each of 400 strong, joined to form eventually the body of the Battalion. It was fortunate that they were of the right age-group and they proved magnificent material on which to build the new unit. The greater number came from the Midlands and the neighbourhood of Birmingham, so they could also claim some territorial association with the Regiment with which they were to link their future. Even so, it will be appreciated that the work of the nucleus of Regulars in equipping and training so many with no military experience whatsoever was exacting. At this time just after the evacuation of troops from Dunkirk there was a general lack of all weapons and for a short time the new entry found themselves literally learning their arms drill with broom-sticks! Lieut.-Colonel C. V. W. Court, M.C. 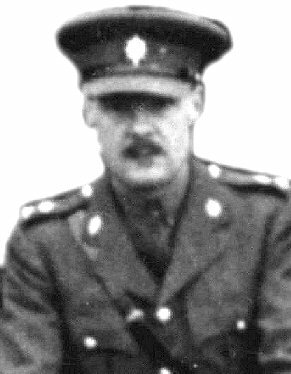 At Hereford Lieut.-Colonel C. V. W. Court, M.C., a senior Regular officer of the Regiment, had assumed command and was to remain with them until May 1941. The parent formation was 13th Infantry Group, under Colonel J. V. R. Jackson, late of the Buffs. On the 17th October 1941 a move was made to Yarmouth, halting at Bedford for a few days en route. Here the Battalion came into the 213 Infantry Brigade under the command of Brigadier E. E. F. Baker, C.B.E., D.S.O., M.C., and set to work on the task of placing some four miles of the coast from Caistor down to Yarmouth in a state of defence. By night the men disappeared into pill-boxes and by day they worked like ants on road-blocks, wiring, anti-tank obstacles, camouflage and all the hurried means of preparation which were to meet a problematical invasion. Had the enemy ever managed to make the crossing he would have found that particular portion of the coast held by a brave and determined unit, but sadly lacking in weapons and with little training or experience. 2nd Lieutenant P. G. B. 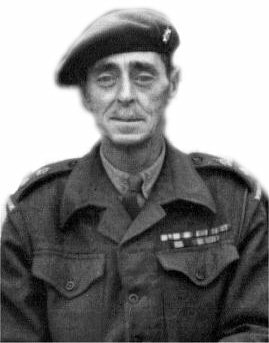 Hall (who later in the 1960's commanded the 1st Battaion), recalls that time; "I was a platoon commander in 'C' Company with 32 men, and had the responsibility to cover three miles of coastal defence north of Great Yarmouth on Caister golf- course. I inherited from the Unit which we had relieved: 1 Hotchkiss machine gun (1919 vintage), but no ammunition that could feed it! Also a dozen bottles of Molotov cocktails which had to be contained in water, otherwise they would explode! In addition we also had a piece of ordinance called the Boyes Anti-tank Rifle, a totally useless piece of equipment. Our weapons tally finished with 3 Bren guns - which were really superb light machine guns - and SMLE rifles (Short magazine Lee-Enfield) with 50 rounds a piece. - Plus a 2in. Mortar capable of discharging smoke, or HE bombs up to a range of 200 yards." passed on from Haselbech it had collected a very large proportion of officers from the home county, while no less than eight officers were Regular officers of the Regiment (At Haselbech the C.O. was Lieut.-Colonel J. T. Milner, O.B.E., who took over on 27th May, 1941). Lt. R. C. L. Whatley, Lt. St. John C. Brooke-Johnson. 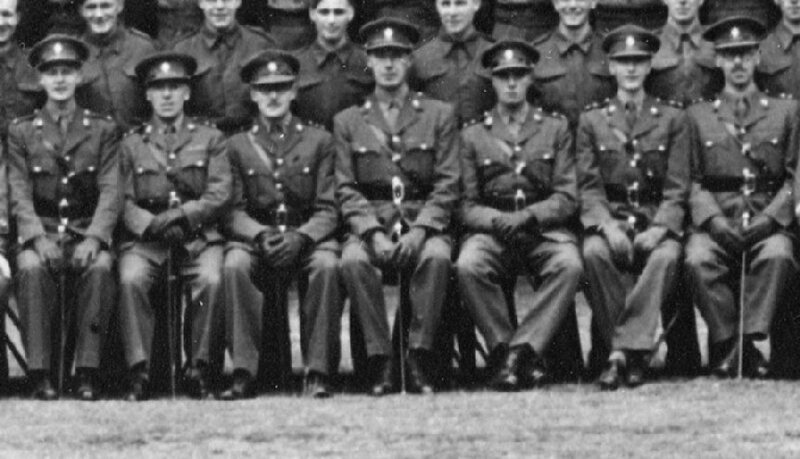 Middle row L to R: Lt. W. L. Leadbeater, Lt. R. N. A. Dingley, Lt. A. R. Kibblewhite, Lt. B. G. T. Hawkes M.C. Lt. L. S. Durrant, Lt. H. R. Matthews, Lt. N. V. Jones, Lt. J. P. Barber, Lt. I. R. Chadwick, Lt. A. D. R. Smith, Lt. K. R. Spink, Lt. D. Y. Watson, Lt. T. W. F. (I.O.) Bollard. 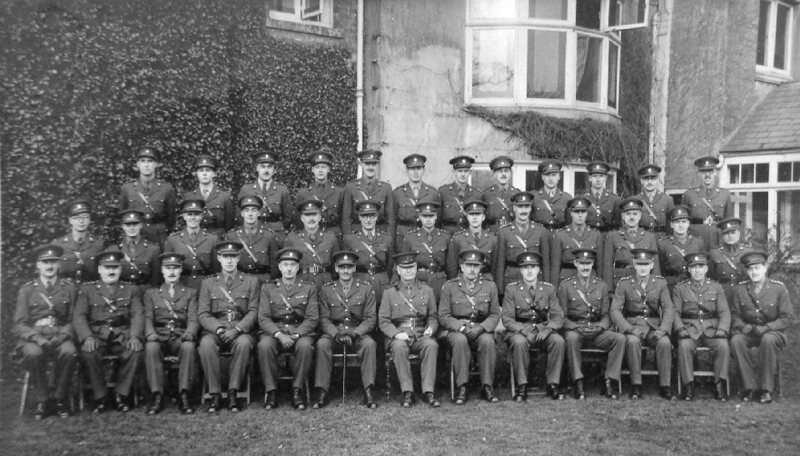 Front row L to R: Lt. H. C. Ewens, Lt. ??????? ?, Capt. P. F. R. Roose, Capt. W. L. Newcombe, Maj. R. B. Moss, Lieut.-Col. J. T. Milner, Capt. A. R. M. Tweed, Capt. J. Gutch, Capt. J. E. Roberts, Lt. (Q.M.) A. Yeates, Lt. E. Whittaker. Reading the records, the layman cannot fail to be impressed by the fine spirit of comradeship and the determination to maintain regimental traditions which animated the new entry. As time went by there seemed to grow a very natural impatience at the inability to put so much enthusiasm in training to the test. As an example of the spirit abroad one notes the Signal and Carrier Platoons indulging in healthy rivalry on route marches, with the last mile of a twenty-mile march being covered at five miles per hour. Back row L to R: 2/Lt. ????? ?, 2/Lt. St. John C. Brooke-Johnson, 2/Lt. Barnes, 2/Lt. E. Tinkler, 2/Lt. J. W Bannister, 2/Lt. J. P. Steele, Lt. M. M. Souper, 2/Lt. R. Whatley, 2/Lt. D. Y. Watson, 2/Lt. E. H. Tilley, 2/Lt. A. D. R. Smith, 2/Lt. N. V. Jones. Lt. H. R. Matthews, Lt. P. T. Weston, Lt. L. S. Durrant, Lt. J. P. Barber, Lt. N. Watkins, Lt. A. R. Kibblewhite. Front row L to R: Capt. P. F. R. Roose, Capt. J. E. Roberts, Capt. ??????? ?, Capt. A. R. M. Tweed, Major ??????? ?, Lieut.-Col. J. T. Milner, Brig.-Gen.l G. W. Saint G. Grogan VC, Major R. B. Moss, Capt. J. W. Tomlinson, Capt. W. L. Newcombe, Capt. A. J. Gutch, Lt. (Q.M.) A. Yeates, Capt. 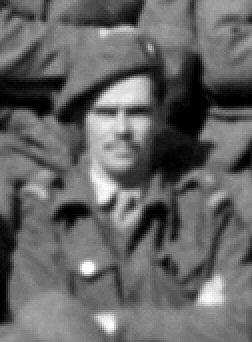 Ian Caldwell RAMC. Training was seldom interrupted by any features of interest outside the local level of normal life. But those who served at the time will recall a memorable occasion when H.R.H. The Duke of Gloucester, with several celebrities in attendance, arrived to inspect at Battalion Headquarters. He was accompanied by the Army Com¬mander, General Sir Ronald Adam, and others of lesser rank—sufficient, however, to represent a galaxy of seniority such as had not yet been welcomed in the short life of the Battalion. With great difficulty a bugle had been procured and a bugler trained, just in time, to blow the Royal Salute! Such were the exigencies of the service in times of much improvisation and intensive preparation. Haselbech was to remain the Battalion home for over a year, and then on 14th June 1942, the process of general post was repeated. By December 1942 the Battalion had done the round of Ashridge, Ipswich, Colchester and Purley, before finishing up at Harrow. At Ashridge the Battalion settled into tents in the seclusion of Ashridge forest and for a time seemed no one's child. R.A.S.C. drivers drove away the vehicles which brought them from Northampton and the reality and purpose of the 9th Armoured Division seemed a long way away. The local Area dealt with administration, and the only operational role allotted was an obscure commitment to guard an alternative but unoccupied site for the Headquarters of Bomber Command in case of a hypothetical parachute attack. There was some interest attached to liaison with the R.A.F., for this offered scope to use the high-powered wireless sets which they had retained with them after leaving the Armoured Division. Otherwise the main preoccupation became drill and weapon training; that fine servant of the Regiment, R.S.M. Hurd, putting in a lot of hard work to keep the young entry up to the mark. On 4th July 1942 the Battalion said farewell to their popular Commanding Officer, Lieut.-Colonel J. T. Milner, who was posted away to the Staff, and in his place they welcomed Lieut.-Colonel W. R. Cox of the King's Shropshire Light Infantry. 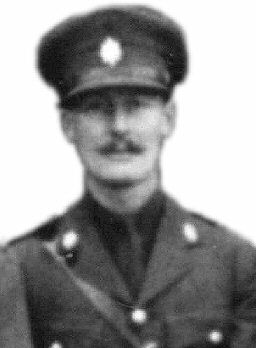 This officer soon became a very staunch supporter of the Worcestershire Regiment and it was indeed by his tireless efforts that many drafts were prevented from splintering away to other units. Ipswich was the next home and here the Battalion was attached to 223rd Independent Infantry Brigade under Brigadier Sir Alexander Stanier. Companies were housed in town billets and training was therefore somewhat restricted. Nevertheless, undismayed by the somewhat uneventful daily round, the Quartermaster set about procuring drums, bugles and fifes, which had suddenly been noticed as featuring in the latest Equipment Tables. There followed a few weeks at Colchester in Roman Way Camp. The twenty miles were covered by march, at the end of which it was pleasant to find quarters in a concentrated area with a central parade ground. There were, of coarse, all the training facilities of a normal garrison town and much time was put in on the ranges. But Colchester is to be remembered for one of those unimportant decisions which yet attract attention. For it was here that the 11th Battalion adopted the very obvious shoulder badge of its motto "Firm" against a green cloth background. At the time, the name of the regiment as now universally worn was confined to units of the Brigade of Guards. There was some outside speculation as to the meaning of the new badge, but our men were quite equal to the occasion when the inquisitive tried to be facetious. From Colchester the process of general post brought the Battalion to Purley and thereby into the 24th (Guards) Independent Brigade Group. The Battalion conformed to Brigade practice and surrendered their green shoulder badges for the conventional pattern. Thus the small green strip emblazoned by the regimental motto after its brief use passed to the collectors' purview and has found a home in the Museum at Norton. At the same time the Battalion took the Brigade badge, which carried the family crest of its founder, Lieut.-General Sir Frederick Browning. The standard of drill and alertness expected was naturally extremely high. But there was a welcome absence of red tape and the informal friendliness of the senior officers of the Brigade was noticeable. The last lap was now in sight as the Battalion moved to Harrow on 5th December 1942, thereby again changing its formation and coming within 33rd (Guards) Brigade Group under Brigadier J. Jefferson. Headquarters was in the town, with companies scattered around in the surrounding country. The one unexacting operational role was the defence of Northolt aerodrome, for which purpose one company was at the West London Shooting School on high ground overlooking the airfield. It was then that a fine new Battalion had to surrender its identity, luckily in the great cause of the reconstitution of the senior battalion of the Regiment. 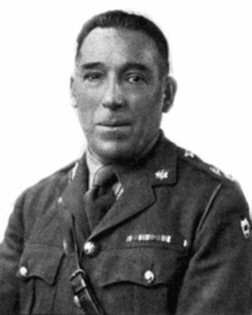 Lieut.-Col. W. R. ‘Willie’ Cox (later Brigadier) commanding the 11th Battalion had great influence at the war office, and arranged for the 1st Battalion to be reformed around the established and well-trained structure of the 11th Battalion. On the 1st January 1943 at Pinner near Harrow the 1st Battalion of the Worcestershire Regiment was reborn when the small cadre of two officers and ten men from the original battalion marched into the centre of the men of the 11th Battalion carrying their Colours. The 11th Battalion was now disbanded and so became the new 1st Battalion Worcestershire Regiment.